The end of October – and the clocks going back – is the traditional time for ‘road safety campaigns’ to start reminding people to get lights for their bike, or to make sure they’re fitted. 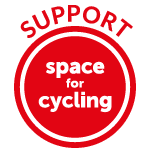 In my view a large part of the problem is that the vast majority of bikes sold in Britain for everyday use – not for sport, or leisure – do not come fitted with lights as standard. Lights are an optional extra that people have to go and out choose for themselves, and then fit to their bikes. It’s hardly surprising that lots of people don’t bother to do this, or that – come the autumn – the (cheap) lights they have bought have disappeared, or have flat batteries, or have stopped working altogether. So the problem of people cycling around with lights could be fixed at source if bikes that were aimed at ‘commuters’, or for daily transport cycling, actually came with lights fitted as standard. With that in mind, I’ve made a short (and hopefully not too rambling) video about the dynamo lighting set-up on my Dutch bike, and how convenient it is. As I say in the video, what’s great about these lights is that I’ve never once had to think about them since I got the bike. They’re a permanent part of it, so I don’t have to worry about taking them on and off. More than that, because they’re powered by a dynamo in the front hub, I don’t even have to worry about charging batteries. The lights will work every time I come to use the bike, guaranteed. The lighting set-up is entirely hassle-free. When I make this point about ease of use – and it’s usually at this time of year – a consistent objection is that ‘UK cycling consumers’ don’t want lights forced on them. Apparently they all want to buy a bike without lights (which is pretty much the standard option in UK bike shops) and then buy some additional lights (which will almost certainly be battery-powered, given that fitting dynamo lights after purchase is much more arduous, expensive and technical) which they have to fit themselves. I don’t find this explanation very convincing. While it is true that ‘cycling enthusiasts’ – people interested in cycling already – may want to customise their bike and add things to it after purchase, your average consumer will want something that is convenient, and that just works, without any extra hassle. By analogy, people don’t go to a car dealership and expect to buy cars without headlights, and then having to go and buy lights separately and add them to their cars. Lighting systems for utility cycling should work in precisely the same way – they should be an integral part of the bike that requires no extra effort on the part of the user. Since I bought my Dutch bike five years ago, I’ve always had lights that worked, without the risk of losing them, or worrying about charging them. The lights just work when the bike moves. It should be this easy for everyone else who steps into a British bike shop and wants a bike for everyday use. This entry was posted in Dutch bike, Lights, Omafiets. Bookmark the permalink. I wouldn’t be without dynamo lighting on any of my cycles. My Dutch Gazelle, PAPER cycle and Raleigh Superbe came with full fore-and-aft dynamo lighting, and I have built SP and Shimano dynamos into the front wheels on our Cooper and Claud Butler cycles. All have SON or B&M lighting, and, except for the Raleigh, have standlights front and back. The problems of leaking or flat batteries are ones I can do without, and most dynamo lights can be fitted in such a way that they’re difficult to steal. The Velogical dynamo is a good option, now, to add dynamo lighting without having to rebuild a wheel. Not that I disagree with your point. Don’t you ever have a problem with the dynamo slipping in wet weather? Otherwise, I’m with you all the way! Modern and/or higher price class bikes have a different dynamo which is either integrated into the wheel, or use a magnet attached to the spokes, distinct by a slightly flashing light at low speeds. Neither can slip. angelahobsbaum, if your question is about the Velogical, it does eventually slip in the rain, but replacing the o-ring which is used as a “tire” to run on the bike’s rim fixes the problem. I carry a spare o-ring and replace it once or twice a year. My replacement o-rings are cheap ones from Harbor Freight. I use mine in the rain regularly. It gives plenty of warning before it starts slipping a lot, getting progressively noisier. The only time mine has stopped working was when I ran through a puddle of liquid water when the air and bicycle were both below freezing. The water instantly froze into a lumpy layer on my rim, and the dynamo wouldn’t run until I chipped it all off. Sorry, Mark,ignore that query; I’ve now watched yoour video and see your dynamo is all in the hub; neat! Dynamo lights are just the business as Mark says. Always there, bolted to the bike and just work. they aren’t even draggy anymore. I just leave mine on all the time. I see lots of people with dim flashing lights or with brackets that never tighten correctly and slide around the bars. Your enthusiasm for the dynamo shines through and I can quite see the reasons for that. But for many cyclists, including me, the very idea is a non-runner. Most of my riding is done in daylight and I’ve no wish to burden my bikes, and therefore my legs, with unnecessary weight. I’m guessing but the combined dynamo, cables, switch and lamps must add up to a kilo’? I know riders who would swap their first-born child for a reduction of that magnitude. And I’m less than impressed with your idea that the system “just works”. If it can break, it will, and always at an inconvenient time. I much prefer to use tiny, rechargeable lights that slip on and off the bike in five seconds, although the pessimist in my soul makes sure there’s a battery powered backup rear lamp in my tool bag. I’ve heard these kinds of arguments in general against Dutch style bicycles and I really don’t understand them. Even if the whole dynamo+lightinh system weighs a kilogram (which I doubt), what’s the problem? Sure, on a bicycle you use for racing every kilogram counts, but on a bicycle for daily commuting and general city use? I feel that the effect of that weight is grossly overestimated. And from experience I can tell that these newer hub dynamos are much more reliable than the old-style ones that roll over the tire: they never fail to function even in rain or snow, and I’ve not heard of one breaking down. Today the majority of the Dutch people on bikes (aka cyclists) don’t use a dynamo, but LED lamps with batteries (3 V. DC). Preferably batteries from Duracell ( winter-proof). Benefits: when one has to stop in the dark, still there is light; no slippery dynamo and/or lowering speed and no noise while cycling. The front and back LED lamps are rather cheap: at the Action Shop for example € 2.59 / £ 2.31 (advert. in Dutch: https://www.voordeelmuis.nl/img/jpg/1669/1669864.jpg ) and € 1.99 / £ 1.78 ( advert. in Dutch: https://www.voordeelmuis.nl/img/jpg/1669/1669865.jpg ), including standard batteries (they are OK when not used very often). Early November I always replace the batteries, although they still measure about 2.4 V.
Within cities, the need and convenience for dynamos is perhaps much less so than if you had to commute in the dark between towns. Most Dutch bikes that have dynamos have the bottle type, which could potentially get slippery in rain or snow. But the kind Mark has is a hub dynamo, eliminating this issue. The cheap snap-on lights are probably sufficient in most cases, but then compared to good dynamo headlights, the contrast is stark. My Dutch friend and I found this out clearly the one night we cycled home together in the dark. His 5 Euro battery LEDs hardly lit anything, while my B & M lumotec premium provided more than enough light for the both of us. I notice that the Dutch are starting to gradually migrate away from the age-old, trusty oma/opa-fiets that are made to last outdoors for many years in all conditions. You still see a lot of them in use because they have lasted through the decades and are oftentimes considered to be acceptable as collateral loss from theft. But the newer bikes, including from brands like Gazelle, increasing focus more on hybrid style and sporty bikes. Most of my Dutch friends and colleagues tend to buy these types nowadays, since they have more speed. Many of them use this as their everyday commuting bike. And sometimes, they will encounter practical limitations that an omafiets wouldn’t have had. My friend’s bike is a Gazelle hybrid. It does not have a wheel lock so if he wants to bike to the supermarket for instance, he needs to bring a separate lock. But it also doesn’t have any racks so he would have to carry everything in a book bag or hang it on the handlebars which is also not handy on the flat hybrid type. And it didn’t come with any lights and also doesn’t have a chainguard, necessitating the use of bands to avoid pants getting caught. As a result, he chooses to walk the 600 meters rather than deal with the hassle just to do grocery shopping. I have the same exact Workcycles omafiets as Mark, and I just ride over to wherever I need, lock the wheel and put all the things in my panniers or front crate and ride back home. Of course this is an extreme example, and there are quite a lot of bikes that are more hybrid-like but still have all the essentials that a traditional Dutch bike has. Slowly it’s becoming more like what you see in Copenhagen, where most bikes are sportier and hybrid-like than a traditional Dutch bike. A popular dynamo in The Netherlands is the no-slippery AXA HR Traction Power Control (https://hollandbikeshop.com/images/AXA%20HR%20Traction%20Dynamo.pdf). I used this model for many years, even in winter. Always worked smoothly, and the pulley is replacable. Yes, I know about the Tour Popular lines. Very beautiful bikes 🙂 But those are becoming more and more rare (relatively speaking). And many of the cheaper variants you see everywhere in stores look like they’ll last a few years at best outdoors. More and more bikes sold these days start to ditch certain components that come standard on the Gazelle Tour Popular and Workcycles opa/omafiets. In the end, it’s probably not a huge problem in most cases. For bike enthusiasts, I guess it’s great to have more control over the look and functionality of your bike. But for most people who just use it to get around, they don’t necessarily think about these knitty gritty things. And then they could end up buying a bike only to gradually discover all the limitations because it didn’t come with lights, or there is no chainguard, lock or rack, etc. These little hassles here and there can add up to frustration after a while. That’s so totally stupid. Just proves that nothing can ever be taken for granted. Interesting that the Dutch are starting to prefer hybrids etc. I noticed in Germany way back in the late 90s people (definitely “people on bikes”, not “cyclists”) were already starting to use battery lighting in preference to dynamos even though it was still technically illegal. In practice, it seems the German police were happy to see some sort of lighting, just like their UK counterparts. All road bikes should have lights and brakes as standard. These are safety items and should have appropriate legislation. Are you suggesting that road bikes are sometimes sold without brakes? That would surprise me greatly. The Dutch, like the Danes and Germans, are no cyclists, but people on bikes, dressed for the destination, not the journey. Riding a bike for commuting, shopping, visiting local friends, leisure, etc. ; at least not for copying the Tour-De-France (thus they don’t arrive sweaty at their destinations, but fit and relaxed). On topic, all the bicycles sold in The Netherlands by official bike shops have lights (by dynamo, batteries or a mix of both), and at least have back pedal brakes. Beyond a century millions and millions Dutch bikes with back pedal brakes have been sold, and they are still very popular: these bicycles are reliable and safe (and rather cheap). Too often overlooked: during WW-II many RAF-pilots, who’s planes have been shot-down by the Germans above The Netherlands, have been saved via Dutch bikes with back pedal brakes! The Dutch could move them fast and silently from the crash-site with these very reliable bikes (the back seat accepts about 90 kilo / 199 lbs)! Commercially considered bicycles with back pedal brakes are less popular at bike repair shops, as they are very seldom broken. They (like to) see customers with broken roller- and V-brakes and handle bars more often. The majority of the Dutch have 2 bikes, one of them is very often a bicycle with back pedal brakes. And they are rather cheap, new about € 550 / £ 500, used about € 55 / £ 50. Typically, hub geared Dutch bikes will have Shimano roller brakes fitted, preferably Shimano-8. I’m all for people who need it having great lighting available, but the vast majority of bicycles sold in the US will never be ridden at night, or in the rain. Heck, many will hardly be ridden at all. It would be a horrific waste of resources to put even a rudimentary lighting system on every Walmart bicycle sold. In fact, if you’re in the USA, go to your favorite real bicycle store and ask if you can have an extra reflector. They will have a large box full of reflectors and brackets that they’ve pulled off bikes, at the customers’ request. Not to mention all the CPSC compliant crappy plastic pedals with reflectors, that are pulled off after sale to be replaced with the customer’s preferred clipless. We already have legislation requiring appropriate lighting when the bicycle is used at night. Can’t argue with the facts – the US bike market is overwhelmingly kids’s disposable WallyMart Huffies and then Very Serious Lycra (or MTB kit). Normal commuter cycling (which would be the larger group in much of western Europe) is restricted to some larger urban areas – in NYC (for example) the hire bikes have their own lighting. The vast majority of the Dutch continue cycling during all weather conditions, day and night, every season. Riding a bike is a habit, like tooth brushing. Well, they should be, sholuldn’t they? Maybe the fact they have no mudgurds and lights is actually the cause for this? No, it is very definitely a cultural, not technological problem. It’s warm and dry inside the car. It’s cultural indeed. With appropiate clothing riding a bicycle in winter, in the rain, etc. is warm, dry and comfortable too. And when it’s freezing weather, with 100% pedal power one get’s warm within about 5 minutes. Except black ice, weather conditions were never an excuse not riding a bike. A bike friendly infrastructure, good lighting, and a 2nd upright city bicycle (= high viz) is of help of course. As cycling is healthy too, the weather conditions becomes less an issue. As evidenced by the comments above, the UK bike market is still heavily weighted to “style” cyclists. To the point people looking for a London commuter bike are sold 22-speed drop-bar carbon road bikes by “knowledgeable” sales staff. I was in a large German bike shop a few years ago. It’s in a (hilly) university town with a relatively affluent population. The vast majority of bikes on display were “Dutch” style – integral dynamos and front and rear lighting with standlights. Sturdy frames, fat tyres and a sidestand were standard. I’d say they had 20 different models on display. Then, there was a pretty good selection of MTBs in one corner, and waaaay over in the other corner – past all the accessories – were the (nice) road bikes – maybe a half dozen to compare. I’m no retail wizard, but I suspect the bikes on display map pretty well to the bikes that get sold. There, bike riding is just something you do – not a “sport” or a challenge. Could certainly welcome this, having just about spotted an entirely unlit rider last night on a (thankfully) quiet backroad as I was on my way home. Only noticed them really due to their pedal reflectors being caught by my own lights as they had on normal dark clothes. A comment of “could do with some lights” was met with “f**k off!”. I never appreciated the convenience of dynamo lights until I bought my town bike. Before it was always such a faff riding with lights in winter. Not only keeping them charged but they always had a habit of hiding at the bottom of my bag under my groceries after I’d stopped at the supermarket on my way home. With a hub dynamo I ride with my lights on all year round. I don’t notice any difference in drag with my lights on or off, and even if there is an impact I rarely ride more than 5 miles at a time so it wouldn’t matter anyway. Best of all it’s one less thing to think about. Just get on the bike and ride…. My bike weighs 12 kilos with full metal mudguards (+mudflap! ), hub dynamo, LED front and backlights (automatic sensor and parking light), and racks. It’s called a randonneur. My 2 bicycles weigh 20 and 24 kilos and both are with LED front and backlights (fed by batteries), have refectors on the pedals and have painted rear guards (white, 28 cm.). Such heavy weight would be a total put off for me; where I live it’s pretty hilly and I regularly cycle commuting distances between 5 and 25 kilometres. Added bonus, I can use the same bike for rides of 100km or more in the mountains. I’m always on my best bike. Dynamo lighting just works. I appreciate it most in daytime(!). For instance, a long ride back in September started in foggy conditions. Really foggy, visibility a few tens of metres. With dynamo, no problem. But if I’d had battery lighting I would have been reluctant to put my lights on, knowing that it might leave me with a flat battery when it got dark in the evening (didn’t get home till about 11pm – via the Chinese takeaway!). What about a helmet with LED light fibre going all the way around the helmet so you can be seen from all directions? Much higher up and thus more visible than lights on bikes! Enjoy an evening bike ride (55 km!) from Utrecht City to Den Bosch City in January 2018 (long version). I noticed a couple of Gazelle bikes came with a hub dynamo that powered only the front light, while the rear light was powered by… a battery. Considering those bikes cost ~500-800€ new, I find it hard to believe it was to save just a few cents to run a wire between the front light and the rear light. Any idea why they did it? Indeed, I suspect not because of the cost, but the fact that those wires (or some other part of the connection) sometimes break, and then it’s a pain to have it fixed, much more so than for the front light. Also, the rear light is not as bright and typically runs on two AA batteries throughout a winter at least. Some LED rear lamps are incredibly efficient and good at minimising battery usage. Some models even turn themselves off automatically when left unused (and back on again!). I suppose to be safe you could use two – one a USB recharging model that you charge up while at work and another small battery one to use in the event you run out of charge. In theory, you’d only use this a few times a year so the batteries would last.